Does travel insurance cover diplomatic faux pas? Let’s hope the Vatican has invested in the deluxe package for Pope Francis. He begins tomorrow a whirlwind visit to the Holy Land that he insists is NOT political, but personal and religious, so naturally his every gesture will be—has already been—deeply scrutinized for any hint of political nuance. There is never anything simple about the visit of a pope to Israel; every moment is fraught with public relations and geopolitical peril. Pope Francis hasn’t even arrived in Jerusalem and the three-day tour is already being attacked by critics from all sides. 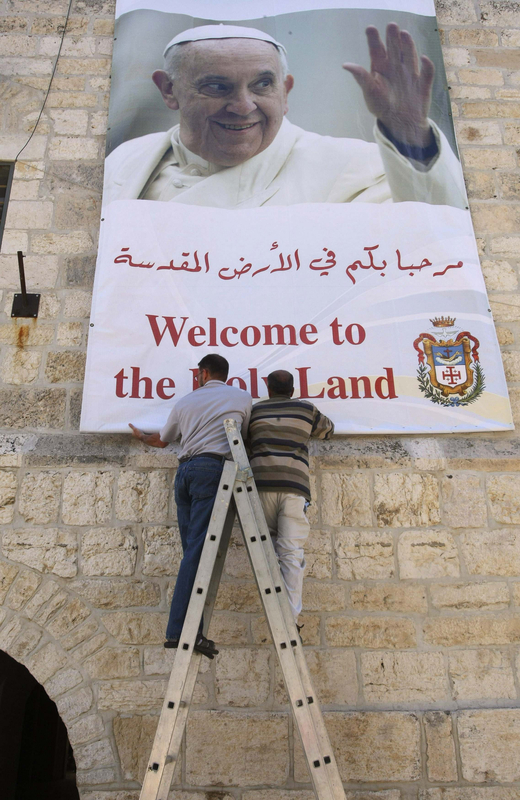 The pope will land in Amman, Jordan and helicopter directly into Bethlehem, thus becoming the first pontiff to visit the Holy Land without first passing though an Israeli checkpoint. This gesture, if it can be called a gesture—Vatican officials insist it is merely a practical measure because of the pope’s arrival on the Jewish sabbath—has infuriated some Israelis and heartened Palestinians. They insist it is an indication of his endorsement of a Palestinian state. Pope Francis invited Argentinian friends Rabbi Abraham Skorka and and Sheik Omar Abboud to add some interfaith panache to his tour, but even that seemingly thoughtful gesture annoyed some who wondered why he did not seek out more local religious figures to join in a more robust interfaith moment. As this trip begins, without, at the pope’s insistence, the bullet-proof popemobile, it’s hard to know who might be more terrified by Francis’ notoriously freewheeling style, the Israelis entrusted with his security or Vatican handlers poring over the pope’s various appearances and pronouncements and praying that he does not veer too far off what will certainly be a cautious script. Many are already expecting a full-throated papal endorsement of Palestinian statehood at some point during the visit—and will be gravely disappointed if they don’t hear one. Others are wondering if Pope Francis will use a meeting with Jerusalem’s grand mufti, Sheikh Muhammad Hussein, to condemn intolerant rhetoric that can lead to violence in this part of the world, a possible snub to the leader of the Holy Land’s Muslims but a welcome corrective to Israelis who hear too many threats and anti-Semitism in his preaching. The breathlessness of the pope’s agenda will weary the media tracking him, and it has perplexed Christians in Nazareth angered that their biblical community has not been penciled into the hurried and busy itinerary. Other Christians in East Jerusalem complain that aggressive pre-emptive Israeli security and its curfew policies and restrictions will mean that their ancient community will essentially be under lockdown during the historic visit. Others already unhappy with the trip include orthodox Jews. They are concerned that a service at the Cenacle, the "upper room" traditionally considered the site of Jesus’ Last Supper and directly above David's tomb, revered by Jews, will open the Mount Zion compound up to regular Christian religious observations; worse has been an increase in vandalism from still unknown parties part of the settler “price tag” movement, who have vandalized Christian sites and left offending messages in protest of the weekend visit. His plans to leave a wreath at the tomb of the father of modern Zionism, Theordore Herzl, is being interpreted as a gesture of acceptance of the Jewish nature of the state of Israel. Palestinian hardliners have already expressed their disgust at the planned ceremony. Though Pope Francis enjoys almost unprecedented popularity among both Jews ad Muslims, such attempts at balance are fraught with peril. The pope insists that he is there to talk and pray, to commemorate the 50th anniversary of Patriarch Athenagoras’s gracious “Good Morning” to his brother Paul and to continue the Roman church’s historic dialogue with its brothers and sisters in Orthodox Christendom. This ongoing rapprochement between the two Christian traditions after 900 years of separation probably represents the least treacherous and most welcome aspect of the visit, but even here, some controversy can be located. The enthusiasm of Patriarch Bartholomew I, the spiritual leader of the world's Orthodox Christians, for dialogue with Rome cannot be doubted. Bartholomew became the first patriarch from the Eastern church to attend a papal investiture since the two branches of Christianity split in 1054, and it was at the pope’s installation that he issued the invitation to meet together in Jerusalem. But Bartholomew, “first among equals” as Patriarch of Constantinople, and leader of 300 million Orthodox worldwide, is not the only powerful voice in contemporary orthodoxy. Many eyes are turned to Moscow, especially as tensions continue in Ukraine, and Patriarch Krill is not sharing Bartholomew’s joy in greater openness and dialogue with the Western church. Pope Francis begins his trip with an effort to bring world attention both to the plight of Syrian refugees in Jordan and more broadly to the suffering and the dissipation of the Christian community of the Middle East. On Sunday he will join Patriarch Bartholomew in a historic prayer service at the Church of the Holy Sepulcher to mark the 50th anniversary of Pope Paul and Patriarch Athenagoras’ encounter. Pope Francis’ first ever visit to Jerusalem appears certain to be a memorable one; let’s hope it becomes one for at least a few of the reasons he intended. The visit by Pope Francis to Jerusalem should reinvigorate the work for Christian unity started by his predecessor Pope Paul VI and Ecumenical Patriarch Athenagoras 50 yeas ago. But without the support of the Orthodox Patriarch of Moscow who commands 200 million Christians it would be hard to achieve a consensus on practical measures for Christian unity between Catholics and Orthodox.The other important step that the Pope should make is to route financial support to the Christian communities in the Middle East from rich charitable Catholics in North America.